Home to around 7000 animals belonging to 400 varied species, this is an ideally place to be in Barcelona if you are travelling with family and kids. The zoo also features interesting fauna, primates, felines, birds and dolphins. 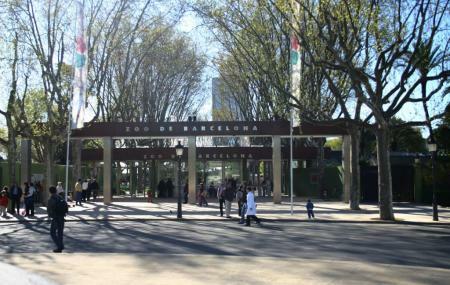 Spread over 14 hectares, the Barcelona Zoo is located within the premises of Parc de la Ciutadella. The Zoo strives for the protections of the species under threat of extinction and also hosts educational programs for children as well adults from time to time. Some of the top activities to do at the Barcelona Zoo are: Dolphin show, Observing Mandrills and titis (the smallest monkeys in the world), tropical bird watching and seals show. The zoo also offers an opportunity to interact with farm animals and to go on a pony ride. Children under 13 years of age cannot enter the Zoo unless accompanied by an adult. Entry is not permitted with pets. Touching and feeding the animals is strictly forbidden. For tickets details of activities and school visits, visit official website. Ticket office closes one hour prior to the closing time. How popular is Barcelona Zoo? People normally club together Barcelona Aquarium and Cosmocaixa Barcelona while planning their visit to Barcelona Zoo. Amazing! Got to say this is better than London Zoo. So many animals to see. Ample seating for picnic/eating and encouraging to see. Just wish they didn't charge extortionate prices for drinks! Layout a bit confusing. Otherwise brilliant! Really great value for money, we spent over 4 hours here and had the best time. Some bits were closed for refurbishment and I think it will be even better once they are reopened. All the animals had ample space and seemed really well looked after. Very nice and clean park. Very big, you can plan an entire day trip. A lot of information is written in English. Beautiful surroundings and nice picnic area. I recommend to take snack and drink with you. We saw a lot of different animals. Very interesting. We enjoyed in dolphin show also. From the animal's point of view, this is kind of a prison - restricted area of movement, many visitors. The reality is a little sad, but it is visible that staff is taking care very good for all animals. All praise for this. In the end is very nice souvenir shop. Amazing zoo. With large enclosures for the animals, hands on experiences and great swing and slide parks for the kids to burn off some energy. The cafes and restaurants are a little expensive but you can take a picnic with you and there are some great picnic tables situated looking over the enclosures and the animals. Zoo Barcelona has been a pleasant discovery for me (I don;t like zoos actually)! Quiet, full of old trees and sunny lawns, it's a hermitage for lots of happy animals. The habitats are built with love and common sense. I loved the possibility to see giraffes, kangaroos, various birds, one amazing Komodo dragon and lots of other inhabitants of this wonderful zoo, where you can spend a day like a journey to the world of nature. The place is definitely worth coming back again and again.